Pass hors d’oeuvres out using theme-ware. 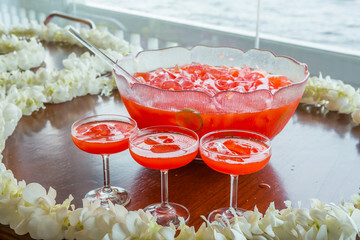 Create and use customized serving trays designed or decorated to punctuate the sponsors cause. Use different food stations, with different motifs, again to underscore the sponsors cause. Everywhere a guest goes, they get the message about the reason for the fund-raiser. Instead of using table numbers, post cards of sponsors, use heroes or other notables that keep the fund-raising theme clearly in the mind of the guests. For example, seat someone at the “Little Johnny Doe” table “a leukemia survivor, whose picture is ceremoniously displayed in the center of the table. Do a different person, cause or icon at each table. Design a dessert, which again continues to underscore the theme of the event. 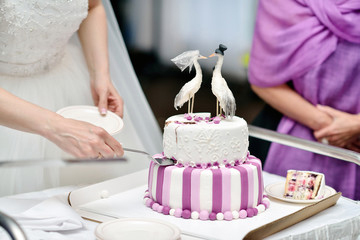 Design a cake with alternating preppy stripes and polka dot layers on the cake. Use contrasting lines of squares, rectangles, and triangles rather than round shapes. Provide very unique notions to tie guest napkins, each one different from the next. Use the colors of the bride and groom where appropriate to have the food and tables coordinate with the newlyweds. Play background music of an era…Disco, Swing, Movies, etc. Offer your client to have an impersonator to greet guests as they enter and mingle during the event. Some great examples would be Elvis, past and current presidents, Liberace or other very notable celebrities. Offer foods that were popular during that era. Have a photographer move about to take pictures of attendees. Also, create a prop that allows people to stand behind it to look like they are dressed in that era. Pass hors d’oeuvres out on phonograph records. Use old records as plate chargers and table markers. They want a caterer who has the time to discuss the event in detail. If they feel you are not engaged, in a rush or not concerned about the details, they will hire a caterer who is. 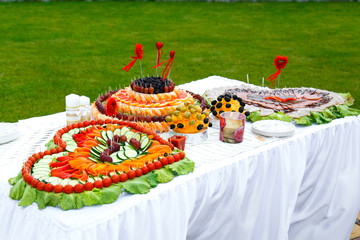 Most people know to look for a caterer who is appropriately licensed, insured, and has current references. Be prepared to provide them with this information and a list of references they can call after you leave. Most clients want a written contract specifying the terms of the event. Every client has a budget. If you can get this information ahead of your meeting with them, you will be able to use your time more effectively. This knowledge will be better able to keep the meeting focused on the outcome as you will have their budgetary constraints already within your grasp. But of course, if they suddenly find flexibility in their budget, be prepared to move along with them. For the budget-minded client, you might be able to better accommodate their wallet if there are tasks that can be off-loaded to the client. Be flexible and creative in finding ways to reduce your labor and therefore your costs in working to accommodate the needs of your prospective clients, especially for items that won’t impact your deliverables. Building in the gratuity up-front (for a fixed amount) can also be of some relief to a prospective client. With an agreed upon figure, the client is not left to worry what the total cost will be…it will be known from the onset. Caterers, colleges/universities, and restaurateurs have repeatedly come to our trade show booth and commented on how wonderful the WindBlocker is. The comments are always the same. It is so strong yet so light weight and easy to carry. We love the fact that it folds flat and that six fit conveniently into the carrying case, and even with all six in the case, it hardly takes up any space and is still very light. However, the best two comments we ever receive still rank as the most impressive. Our existing customers always comment on how hot the food is. Which of course is the goal of every chef. The other comment we hear repeatedly is that the pros tell us that they are getting rid of their existing chafers and replacing all of them with the WindBlocker. Take advantage of our October promotion (a free Carrying Bag with every purchase of WindBlockers). You too can join the countless others who swear by the WindBlocker. But the offer won’t last.